What’s the story: In the final moments of the Sri Lankan civil war a Tamil tiger (Jesuthasan) flees to France along with a fake wife (Srinivasan) and daughter (Vinasithamby) to begin a new life with a new name – Dheepan. Working as a custodian, he tries to forget the horrors of war. What he encounters in his new surroundings is a new, but just as destructive battle. A Prophet and Rust & Bone director Jacques Audiard returns with hard hitting subject matter in this 2015 Cannes Palme D’Or Winner. What’s the verdict: With three nominations under his belt Jacques Audiard finally, deservedly struck D’Or with the story of a Tamil refugee adapting to life in a forgotten French ghetto. After taking part in a Sri Lankan atrocity, Tamil Tiger Sivadhasan flees to France. 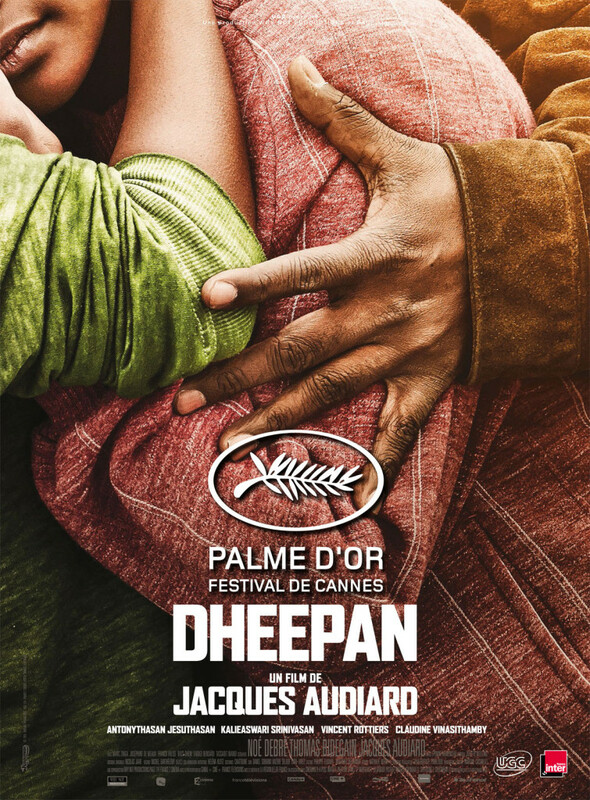 His fellow warriors chillingly bestow upon him a victim’s identity – Dheepan. Forced to travel as a family, he is given a wife, Yalini and daughter, Illayaal, who oblige enthusiastically as they see an opportunity to leave the camp. After hustling on the streets he is finally granted asylum with his ‘family’ in the rural area of Le Pré. But, in the drug fuelled ghetto it is clear Dheepan has just swapped one warzone for another. Dheepan though is not fazed. Jesuthasan’s stunning and captivating performance shows a man yearning for atonement above earthly comforts. Audiard pulls off the difficult trick of humanising a war criminal, muddying Dheepan’s loyalties in a gripping scene with a former Colonel that suggests he was coerced into his wartime actions. Released at a time when the world’s eyes are on the refugee crisis, the film powerfully depicts the struggle of a desperate people. For him and his family everyday life is a literal fight, and through hard graft and determination they start to succeed. Yalini secures a well-paid job caring for the ghetto kingpin’s father. Illayaal performs well at school. Dheepan is respected and essential to the maintenance of the community buildings. And a genuine bond begins to form in the fake family. Though Audiard keeps tension bubbling on a constant boil. The gangland environment just outside the door could destroy everything they have worked for. When good times sour Dheepan shifts into high gear and Audiard delivers sweaty-palmed suspense a la A Prophet. When reality comes crashing back down after a brutal shootout, Yalini wants to flee but Dheepan refuses, triggering a scene of the year contender as fake husband and wife go tête-à-tête. It makes Pacino and De Niro’s in Heat look like Sunday lunch. After A Prophet and Rust and Bone Audiard again proves a master at weaving multiple plot threads and social issues; here’s hoping his A* CV does not get tainted by a C grade Hollywood thriller. Depicting the ghetto at its very roughest, echoes of La Haine are inevitable (though Audiard will probably argue otherwise). As with Tahar Rahim in A Prophet, the director has also discovered two more gems in Antonythasan Jesuthasan and Kalieaswari Srinivasan, in what are the breakthrough performances of the year. Kalieaswari Srinivasan’s character arc from sceptical, unsupportive member of ‘the team’ to upbeat and determined wife is seriously impressive. As the film closes, you feel happy that Audiard has finally won the Palme D’Or. And you hope Dheepan finds his own happiness.